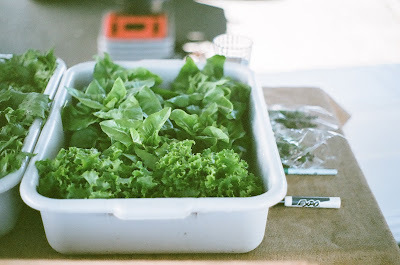 I visited a farm the other day devoted entirely to lettuce. It was Veronica Worthington's garden, the Herb Farm in West Dennis, the sister to her Pleasant Lake Farm in Harwich. Veronica tried her hand at a lettuce checkerboard a few years back—you know, the sort with carefully measured one foot squares and perfectly spaced heads of Lola Rosa and Lola Bionda in zig-zags of green and red—and by the end of June, she'd fallen in love. She'd haul her stepladder out from the garage every few days or so, set it up in the backyard and get up high to admire her work. When the heads were ready to harvest, she threw a party in the garden, a benefit for the library downtown, and everyone milled around ooh-ing and ahh-ing and snapping pictures of her work. Finally, they pulled the lettuce from the ground, shook off the dirt, and sat down in the yard to eat. The checkerboard has been getting bigger every year since. These days, it's an acre on the outskirts of town, 3,000 heads of lettuce in perfect squares. She says the pattern has sort of gone out the window, because every time she picks a head to sell at the farmers' market, she stuffs another one back in. There might be a tiny icebery next to a huge, leafy romaine, or a whole row of full size black-seeded Simpsons. All in all, she grows 35 varieties of lettuce, but she's heard there are over 800. That's her next goal—to try growing every single one. But for now, she's focused on miniatures. Personal lettuces, she calls them, miniature icebergs and miniature romaines and miniature Boston heads. The icebergs are her favorite—plain green, and tight-knit heads that change from burgundy to jade. Partially, this is a matter of appearances; the minis are a charming size, perfect in their pressed little heads and closely held drapes. But it's also about taste. The miniature icebergs are crisp, cool, watery—the antitode to humid June afternoons and sun burnt ears, the prelude to Hendrick's and tonics in chilled pewter cups. Veronica imagines a world where we all return to the Russian and iceberg pairing of the 1960s, housewives across the country filling up their shopping carts with mayonnaise and ketchup, minced pickles and dill. She remembers that era well—the time when iceberg was all we knew, after the Boston lettuce of the 1800s and during the reign of California as the salad bowl king, before we discovered mixed greens and nutrients. The wedge is in vogue these days, but somehow, by some trick, the Russian dressing didn't reappear with it. Except on my table. Veronica made Russian dressing sound so good, so just the thing for miniature iceberg, that when she sent me home with a head, I had to whip a batch up. I dug through the refrigerator for ingredients: homemade mayo, one of my mother's pickles, a bundle of dill. I have no idea if the results are anything like the Russian dressing of the 1960s, but if they were, well, I'm a convert. I'm still not sure about platform shoes or Pocahontas headbands, but I think—I'm quite certain, in fact—that Russian dressing deserves another spin. I didn't turn up any ketchup when I went to make this dressing, so I used rosehip jelly instead. I remembered thinking when I made the jelly last summer that it smelled a lot like tomato sauce, and it made a fine substitute. Any of the following three—ketchup, tomato jelly, or rosehip jelly—would work well in this recipe, I think. 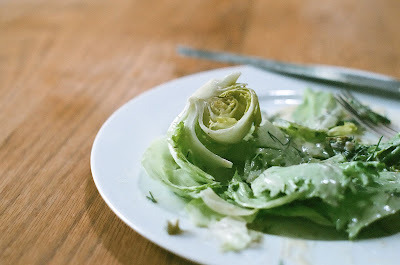 Pull any bruised outer leaves from the lettuce heads, and remove the stems from the bottoms. Place whole on two plates. In a small mixing bowl, whisk together mayo and ketchup or jelly. Add 1 teaspoon white vinegar and 1 teaspoon water to the mayo mix, and continue adding the two liquids in equal parts until the mixture reaches a consistency you like. Stir in the pickle and the dill, and season with salt and pepper to taste. Pour the dressing over the iceberg heads, and serve at once. i love it! the simple pleasure of wathcing your garden grow and lovingly enjoying the fruits of your labor. isn't it fun? if you ever have a chance to go see her lettuce garden, you really should. she'll tell you about every single head in detail---it's fascinating!